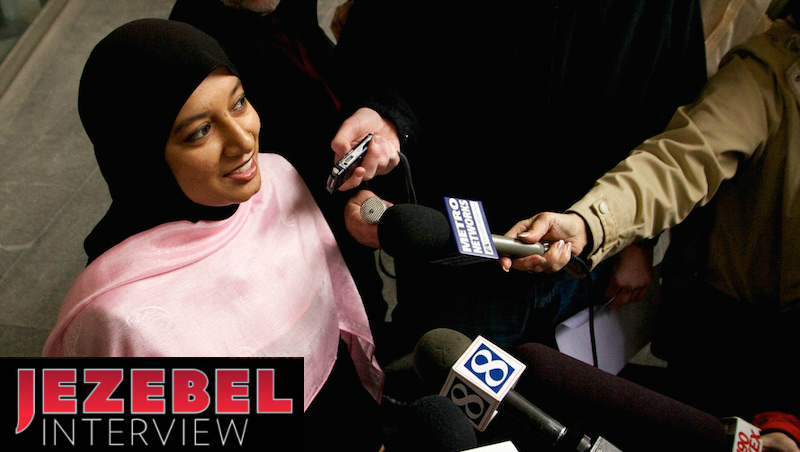 Jezebel readers likely know Saba Ahmed as the woman who threw Olympic-level shade on Fox News when she wore an American flag hijab. She is also the 30-year-old founder and president of the Republican Muslim Coalition, and she has as much patience for GOP fuckery as anyone I’ve encountered. Since September 11, 2001, Republicans have harped on the importance of the fight against radical Islam, causing a large portion of Muslims to seek political refuge in the Democratic party. Today, Ahmed—who was once a Democrat—is up against the most fervently Islamophobic slate of Republican candidates in years. Still, she would rather change minds within the party than desert it altogether. I spoke with Ahmed on Wednesday, just one day before the Fox Business Republican debate, about why she has so much faith in a party seemingly intent on smearing her religion, and who she would vote for tomorrow if she absolutely had to choose. I grew up in Oregon, which is a pretty blue state. Everybody I knew was a Democrat, but I became Republican after getting involved with the Democratic party and realizing how I couldn’t support a lot of the liberal values. I felt my faith aligned with the Republican party: we were pro-life and pro-traditional family values. And that’s why I became a Republican. So you really switched because of the social values? Can you cite a specific event that caused you to switch? I worked on a bill in 2010 that repealed Oregon’s ban on Muslim teachers from wearing their headscarfs in public schools. We were able to change the law of the land in Oregon, and that was all because some Republicans had helped us get it passed on the Senate side. That was my first experience seeing Republicans being very strong in faith, values bills. And that helped change my views on them. How did your organization come about? This happened when I moved out here to Washington DC. We formed this group last year to promote Islam and Muslims within Republican circles because I felt there was so much animosity and hatred against Muslims and there was hardly any Muslim Americans talking about it. How many people are a part of it today? We’re just getting started. We have a small staff here but we’re trying to form chapters in all key electoral states to get more active for the 2016 elections. We’re hoping to have Republican Muslims in Texas, Florida, Virginia, and other places that host federal congressional delegations reach out to their Republican representatives. And possibly even host a GOP presidential candidate. I feel like your role in the Coalition turns you into a spokesperson for Republican Muslims, and to Republicans on behalf of Muslims. What does that mean for you? Yes, definitely, I mean I’m very passionate about my faith and I don’t like it being disrespected by people, especially some of the GOP frontrunners. And that’s why we’re working to develop good relationships within the GOP and we hope to be more active within Republican presidential circles. We’re hoping to meet with Donald Trump in the next few weeks to hopefully change his perspective with Muslims as well. And hopefully the other ones as well going forward, Ted Cruz and Rubio and others. Do you feel the pressure to have to speak for all of one group? Yeah, definitely. I definitely do. It’s challenging because I would love to see other Muslim American groups speak out, but there are so few Republican Muslims who are active on media. So I often get thrusted on that. But I do enjoy it. I do like doing that. Why do you think there are so few? Because not that many people like getting involved politically, especially because it brings with it a lot of—you become a target and a punching bag for a lot of people and especially in the political climate right now. There are a lot of Muslims that are hated, any of them who try to do anything become a target. And you know, I’ve been called a lot of names and a lot of things. But, you know, I feel like we have to still develop a thick skin and do what we need to do to achieve our objectives. A lot of people view Islam and American conservatism as being incompatible—largely because the leading presidential candidates have been so vocally Islamophobic. How do you reconcile that with your political beliefs? I think the reason they are so Islamophobic is because they don’t know many Muslims and they don’t have Muslims involved in their campaigns. That’s why I feel like, you know, just like with any other new group, you have to get involved in their politics in order to change their hearts and minds. We have not endorsed any particular candidate. We’re working on educating a lot of them and so right now we have not taken the position of endorsing any of them. And we have to do our best to make sure that we can change their minds. It may take some time but I’m hoping by the time our GOP nominee gets elected they will have heard from us. If you had to vote for someone tomorrow, who would it be? We are working, like I said, with the Trump campaign right now to bring him to a mosque and meet with imams and Muslim American leaders. I think his economic policies are good, he has a good business background. If he puts his mind together to actually help fix the budget crisis and stuff, he could be a great presidential candidate. But because of his other rhetoric against Muslims and stuff, a lot of Muslims wouldn’t see themselves voting for him. Trump specifically probably doesn’t align with the social values that drew you to Republicanism. Why would he be the candidate that you’d be interested in? Because of his business background. I feel like Washington needs somebody new and non-establishment, and I think Washington could use a good businessman who knows how to fix the budget. Our economy is not doing so great. There is so much fiscal irresponsibility. I think having a good Republican president would certainly help. Is the idea, theoretically, that if Trump were a Republican president, he would support the kind of values-based legislation you’re looking for? Yeah, I would support his business skills, and I would like to see him help fix the issues facing our economy and help drive economic policy better and help Americans. Do you have a pitch? Why Muslims should vote Republican? Because our Islamic values align with the Republicans. Islamically, we believe in things that the Republican party stands for. Right now the GOP platform is very strict on immigration. How do you feel about that? We definitely want immigration reform. We would support legal immigration. I mean, I don’t think a blanket ban on Muslims is the right solution. I think there’s a lot more stuff that needs to be done. We can’t support unconstitutional laws and so hopefully we can work on good policies that support legal immigration from all over the world. Do you think that pop culture representations of Muslims (like in Homeland or Quantico) have any affect on the lives of American Muslims? Yeah I mean there’s that anti-Islamic climate, putting all Muslims as suspects. It’s playing on people’s fears and emotions. When you can scare someone and you can put them in that fear zone, you can get them to do anything pretty much. And so, sadly, some people are misusing that. Trump’s statements last month, they came out at a time right after San Bernardino attacks. They targeted American fears, especially in South Carolina where there aren’t that many Muslims. A lot of these candidates are trying to take advantage of that fear. Right, right. But I don’t think that’s sustainable. They might get a few poll points now but I don’t think that it’s going to fly through November. And their policies are definitely going to be more fleshed out. And anybody who is going to continue that rhetoric isn’t going to make it through. Did you watch the State of the Union? Do you have any thoughts? I was glad to see Muslim Americans attend the State of the Union. Many Democratic members of Congress invited Muslims to attend and I thought that was a brilliant step. Obama was, while we disagree with a lot of his policies, I was really appreciative of him calling out that we shouldn’t target all Muslims and we shouldn’t hurt our American values by condemning one religion. What are you hoping to see in the GOP debate? But, it’s a Fox Business debate. So I’m hopeful they’re going to be talking more about the economy and business issues that are going to be the deciding factor for us. [laughs] I’m trying to stay as patient as I can. You kind of have to be very patient to deal with and do the work that I’m doing, but I’m definitely trying to stay as patient as possible.